9007-0035. Sterling Silver Souvenir Spoon President Cleveland. Washington, DC. Hdle obv. embossed portrait view of Grover Cleveland + embossed view of American eagle + fasces. BL: embossed view of "Washington" Capitol Dome. Bowl = gilded. 9007-0036. Sterling Silver Souvenir Spoon President Cleveland. Washington, DC. BL: embossed view of "The Capitol. Washington" + US Capitol and Dome. 9007-0037. Sterling Silver Souvenir Spoon Neu Amsterdam Youth. Hdle obv. embossed view of New York State coat-of-arms at the top of the handle + a figure of a young Hollander in relief with a pipe, and dressed in the old Dutch costume, while on th shank of the spoon is the name, in fancy lettering, "New Amsterdam." Hdle rev. decorative reverse + monogrammed "AMK" (??). 9007-0038. Sterling Plate Souvenir Spoon Rip van Winkle. Hdle obv. embossed view of frontal portrait of Rip Van Winkle. Stamped: Sterling Plate. (this spoon is NOT sterling but it is stamped "Sterling Plate" — a clever marketing ploy). 9007-0039. New York. Rebus & Advertising. Hdle obv. emb vw of SS of New York + Niagara Falls + "New York: on stem. Hdle rev. emb vw "State Capitol" + "Statue of Liberty" + "Grant's Tomb." BL: bright cut engr. of shirts, collars, cuffs + "Troy" [shirt capitol of America]. 9007-0040. 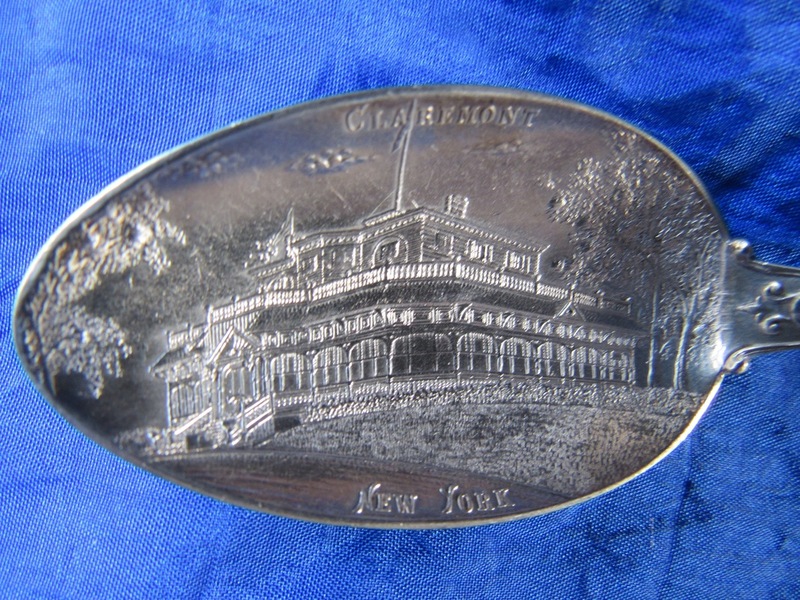 Silverplate Souvenir Spoon. Lake Ronkonkoma. Hdle obv. Pattern hdle + engraved "M.G. Babcock Co." -- a real estate company on Long Island (NY) that sold summer cottages and plots of land in/or near Lake Ronkonkoma which in the early decades of the 20th century became a resort area. BL. emb. view of "Lake Ronkonkoma L.I." 9007-0041. Floral Pattern handle. Rogers' Sugar Bowl Spoon. Hdle obv. flower (daffodil) floral handle. BL: plain bowl with decorative flowers. MK: William Rogers & Sons AA + Pat. Nov. 29. 1910. 9007-0042. Silverplate Souvenir Spoon. Thistle Finial. Hdle obv. engraved cut-out finial with a view of a Scotch Thistle. Hdle obv. Three spoons with protract of Benjamin Franklin at the finial ± “Benjamin Franklin 1706 -1956. Goodwill Ambassador” + “Officially Approved 250th Anniversary Committee” + embossed Liberty Bell + decorative stem. 3 spoons for one money. 9007-0045. Silverplate Souvenir Spoon Elizabeth II. 9007-0046. Silverplate Souvenir Spoon Panama Pacific Exposition. Hdle obv. embossed view of “tower of Jewels” + “Panama Pacific Exposition” on stem. Stamped: California Perfume Co. 1915. 9007-0047. Silverplate Souvenir Spoon Sunny Jim. Hdle obv. embossed Pattern hdle. K: Wm Rogers & Son AA. 9007-0048. Sterling Silver Souvenir Spoon Guernsey. 9007-0050. Quis Nos Separabit. Peninsular & Oriental Steam Navigation Company. British Silver Enamel Souvenir Spoon. Hdle Obv: enameled shield on finial with "Quis Nos Separabit." BL: embossed words: "Peninsular & Oriental Steam Navigation Company." Hdle obv. Rabbit with long ears + “Bakersfield” on stem. 9007-0052. Five (5) Mors Dag Gold Plated Souvenir Spoons. Maker: Designed by Inventor and Patentee: Falle Uldall. 9007-0053. Sterling Silver Souvenir Spoon Profile Rock. Little Falls, N.Y.
MK: Towle (? – mark not clear but best guess is that it is Towle). 9007-0055. Sterling Silver Souvenir Spoon William Penn + City Hall. Hdle obv. FF view of Wm. Penn + “Philadelphia” on banner. MK: Alvin + Feb. 1897. Retailer: J.E. Caldwell & Co.
9007-0056. Sterling Silver Souvenir Spoon Cowgirl Salt Lake City. Hdle obv. FF Cowgirl riding on a horse. Hdle rev. showing back view of cowgirl and horse. 9007-0057. Sterling Silver Souvenir Spoon Statue of Liberty. Metropolitan Life Building. Hdle obv. FF view of Statue of Liberty with raised right arm holding torch. Hdle rev. FF view of the back of Statue of Liberty + Brooklyn Bridge. 9007-0059. Sterling Silver Souvenir Spoon 4-leaf clover spinning wheel. Hdle obv. Embossed view of 4-leaf clovers on handle. 9007-0060. Silverplate Souvenir Spoon Sherwin Williams. Annual Convention I.A. M.H & D.
Hdle obv. Embossed view of globe covered with paint + Sherwin Williams’ lizard symbol. 9007-0061. Political Memorabilia Silverplate souvenir Spoon. Wm J. Bryan. Good Luck Symbols. 9007-0063. Sterling Silver Souvenir Spoon Doughboy Plattsburg New York. Hdle obv. FF view of Doughboy (standing at attention) holding a rifle. Hdle rev. FF reverse view of Doughboy. 9007-0064. Silverplate Souvenir Spoon Joseph Jefferson Souvenir Spoon. Hdle obv. Embossed view of Jefferson seated with left foot on a stool” + “Joseph Jefferson” on lower shank. Hdle rev. embossed decorative reverse. BL: embossed with "Here's Your good health, and your family’s and may they all live long and prosper." 9007-0065. Sterling Silver Souvenir Spoon Oshkosh Wisconsin City Hall. Hdle obv. acid etched “Wild Rose” pattern (See: Zinn. Paye & Baker. P. 13 #21142).